The Oliver MacLeod Projet Nova-Temp HT6103+ insulated stainless steel chimney from Security Chimneys is designed for fast, easy and secure installation with a twist-lock assembly. 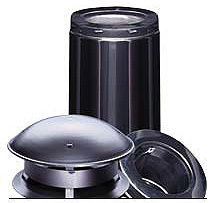 A double-tapped flue system allows for radial expansion and the maximum available level of durability. The Nova-Temp HT6103+ chimney is available in 5" to 10" inside diameters. Use the form below to request more information on Projet Nova-Temp HT6103, and a Kastle sales rep will get back to you as soon as possible. Fields in red are required.